I found that quote scribbled in the margins of a used copy of Wine Marketing & Sales I purchased from Amazon. I have no clue about the original author. However, a cynical corollary to that proverb often gets bantered about during Pride Month. The origins of Pride is about the LGBT community overcoming obstacles and affirming our right to live openly and without fear. It’s something that is still needed even today. Yet every year there are concerns that the significance of Pride is lost in lieu of having a big ole party. But this conflict isn’t unique to Pride. Many religious and secular holidays such as Christmas and Memorial Day have drifted far from their original meaning. Far from sitting on the sidelines, the alcohol industry is often at the forefront in this crass commercialization of holidays with producers and retailers banking on the uptick of sales during the winter holidays to make their financial year–which is why things like “reindeer wine,” boozy ornaments and whiskey advent calendars exist. Likewise, every Memorial Day will prominently feature large liquor displays at stores–not necessarily to help people remember the sacrifice of service members but rather to “toast the beginning of summer” with a packed cooler and a 3-day weekend. Even with the many challenges we still face (especially globally), the LGBT community has indeed moved beyond being universally shunned and shuttered into the closest. We’re now a very marketable demographic that businesses eagerly seek. With an estimated purchasing power of nearly $1 trillon in the US, on a global scale, the LGBT community would have the 4th largest GDP of any country at $4.6 trillion. Is it any wonder why businesses see Pride Month as “Gay Christmas”? Again, you can look and find examples of the alcohol industry leading the way with vodka brands like Absolut and Smirnoff developing ad campaigns for the LGBT community since the 1980s and Anheuser-Busch being a fixture at Pride events since the 1990s. In the wine industry, Clos du Bois (now part of Constellation Brands) began donating in the mid 1990s to LGBT causes like the AIDS Memorial Quilt project and highlighting their involvement in print ads. Over the next decade, more wine brands would regularly sponsor Pride events and advertise in LGBT publications. These included Beaulieu Vineyard (Treasury Estates), Domaine Chandon (LVMH), Rosemount Estate (Treasury Estate) and Merryvale Vineyards. Travel and wine events catering to the LGBT community emerge such as Out in the Vineyard that started in Sonoma in 2011 with sponsorship from Boisett Family Estates, DeLoach, Gary Farrell, Iron Horse, J Vineyards, Jackson Family Estates, Lasseter Family Winery, Muscardini, Ravenswood, Sebastiani and Windsor Oaks among others. It’s not just wine, it’s GAY WINE! Most of these early marketing campaigns were based on promoting existing products. However, soon producers began developing exclusive products targeting LGBT consumers. Kim Crawford (Constellation) takes credit for creating the world’s first “gay wine” with its 2004 launch of a rosé named Pansy. Though not necessarily claiming to be a “gay wine”, Rainbow Ridge Winery in Palm Spring, owned by LGBT owners, may have beat them to the punch with their 2001 Alicante Boushet. They certainly win on the merit of having a far less offensive name. In Argentina, the Buenos Aires Gay Wine Store partnered with a local Argentine winery to produce Pilot Gay Wine in 2006. While debates about gay marriage was carrying on globally, Biagio Cru & Estate Wines created a sparkling Cremant de Bourgogne named Égalité (meaning “equality”) in 2013 to celebrate the crusade for marriage equality. Lest other segments of the industry get left behind, in 2011 Minerva Brewery in Mexico released what they called the “World’s First Gay Beers” with two honey ales–Purple Hand Beer and Salamandra. I understand the instinct to chafe at the “Curse of Pink Washing” and the sense of being pandered to by corporate interests. That is my initial response to a lot of gay marketing. But I can still celebrate the meaning of Christmas while putting up snowmen and Santa decorations. Likewise, the solemnity of Memorial Day can still be observed while BBQing burgers and brats. For me, I won’t begrudge any business for creating special “Pride packaging” or products. However, I won’t give them a free pass either. The quality still needs to be inside the colorful wrapping to merit a positive review or a second purchase. 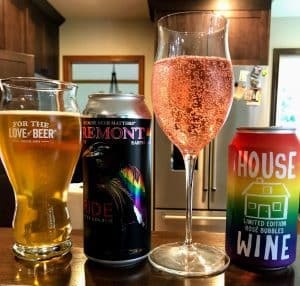 In that vein, I decided to try Fremont Brewing Pride Seattle Kolsch and House Wine’s Limited Edition Rosé Bubbles Can and review them below. I’d definitely buy this even outside of Pride month. Medium intensity nose with fresh wheat grain and some subtle lemon pastry notes. The mouthfeel is refreshing. Very well balanced with the citrus notes more pronounced. Extremely session-able with low hops and plenty of malted grain flavor. Sourced from “American Grapes” of unknown variety or origins. Medium-minus nose with faint and not very defined red fruit. There is also a tropical rind note that vaguely reminds me of cantaloupe rinds. While certainly not “bottle fermented”, it’s very likely that this wasn’t made via the Charmat method or tank fermentation either. Most likely Precept made this with straight carbonation like soda. On the palate, the bubbles are very coarse and almost gritty. Slightly bitter phenolics brings up more of the rind note from the nose. It segues into apple peel with just a little bit of unripe strawberry representing the faint red fruit. 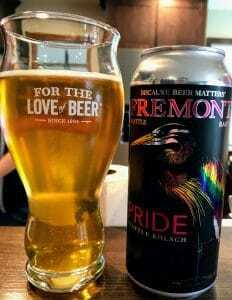 The Fremont Pride Kolsch was a very enjoyable beer in its own right. Even beyond Pride, it’s worth $8-10 for a four pack of 16 oz cans. 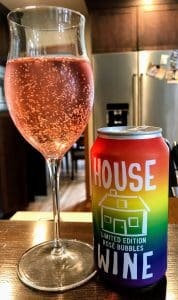 The House Wine “Rainbow Bubbles”, however, was very reminiscent of Cook’s or Andre’s. It honestly seemed like someone took a light rosé and put it through a Soda Stream. At $4-5 for a 375ml can, I’d much rather spend $3-4 more to get a bottle of Spanish Cava. That would be something worth toasting Pride with. Tagged Absolut, Andre’s, Anheuser-Busch, Beaulieu Vineyard, Biagio Cru & Estate Wines, Boisett Family Estates, Buenos Aires Gay Wine Store, Clos du Bois, Constellation Brands, Cooks, Cremant de Bourgogne, DeLoach, Domaine Chandon, Égalité, Fremont Brewing, Gary Farrell, honey ale, House Wine, Iron Horse, J Vineyards, Jackson Family Estates, Kim Crawford, Kolsch, Lasseter Family Winery, LGBT issues, LVMH, Merryvale Vineyards, Minerva Brewery, Muscardini, Pilot Gay Wine, Pink Washing, Pride Month, Rainbow Ridge Winery, Ravenswood, rose, Rosemount Estate, Sebastiani, Smirnoff, Sparkling wine, Treasury Estates, Whiskey Advent calendars, Windsor Oaks, Wine in a can, Wine Marketing & Sales.